Oakland East Bay Symphony (OEBS) celebrates its 24th anniversary as a regional orchestra that serves the diverse population of the East Bay. It has gained wide recognition for its unique convergence of artistic excellence and community service. OEBS was incorporated in July 1988 through the efforts of the Oakland Symphony Musicians Association and the Oakland Symphony League. Former guest conductor Michael Morgan was appointed Music Director in 1990. Concerts were performed at the Calvin Simmons Theatre until moving to the Paramount Theatre in the 1994-95 season. The Symphony's growth has resulted in such landmarks as the addition of its American Masterworks Series including concert performances of Bernstein's Mass, Gershwin's Porgy and Bess, and Sondheim's Follies, in addition to numerous awards including ASCAP's Award for Adventurous Programming in 2006. Under the artistic leadership of Maestro Morgan, Symphony activities reach over 75,000 people annually, with more than one-third of the operating budget dedicated to education and outreach programs. These programs include several acclaimed education programs under the umbrella of the MUSE (Music for Excellence) Program: In-School Mentor and Instrumental Instruction, Young People's Concerts, Ensembles in the Schools, Young Artist Competition, Free Ticket Distribution and regular school visits by Michael Morgan and other musicians. These programs serve over 21,000 young people each year. OEBS has fostered collaborations with local arts organizations from children's choruses to jazz ensembles to dance and opera. The Symphony showcases new American works in performance and encourages young artists. In its efforts to support new music, OEBS formed a multi-year partnership with The James Irvine Foundation in 1998 to initiate various commissioning projects including the newly established New Visions/New Vistas initiative. 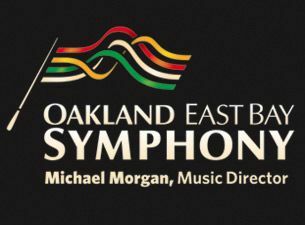 In June of 2010, OEBS forged a closer partnership with Oakland Youth Orchestra and Oakland Symphony Chorus in a merger that resulted in the formation of East Bay Performing Arts.